For those interested, I will be presenting a lecture at the Camarillo Public Library on Oct. 9 @ 6pm. The lecture is open to the public. Abstract: In this lecture series, Dr. Brian Thoms will present on issues surrounding fake news. While the subject has received wide-spread attention in the run-up to the 2016 U.S. presidential election and post-election, the concept has been around for centuries and refers to the deliberate publication of misinformation and or hoaxes in mainstream media. 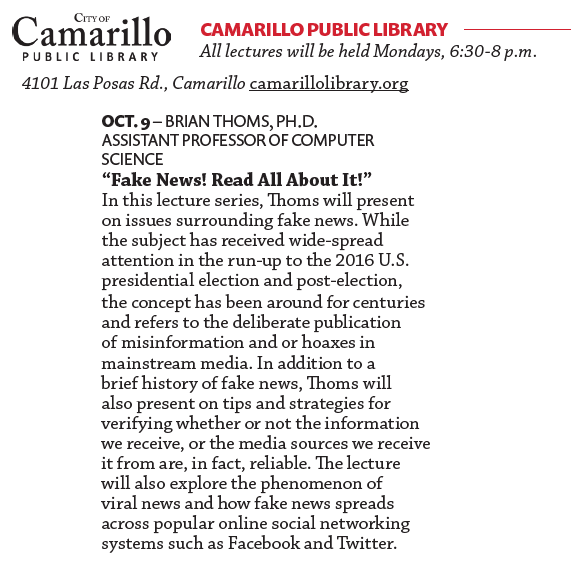 In addition to a brief history of fake news, Dr. Thoms will also present on tips and strategies for verifying whether or not information we receive, or media sources we receive it from are, in fact, reliable. The lecture will also explore the phenomenon of viral news and how misinformation spreads across popular online social networking systems such as Facebook and Twitter. I will also be serving as panelist on Contemporary News and News Gathering in Thousand Oaks. This program will be held on Thursday, October 12 beginning at 6:30pm at the Grant R. Brimhall Library. Panelists will include media experts from KCLU, the Daily News and Los Angeles Times and will be moderated by TO Mayor, Claudia Bill de la Pena.